The usual way to use this class is to call one of the static convenience functions, e.g. getFont(). See also QFont, QFontInfo, QFontMetrics, and Dialog Classes. The dialog is called name, with the parent parent. initial is the initially selected font. If the ok parameter is not-null, *ok is set to TRUE if the user clicked OK, and set to FALSE if the user clicked Cancel. 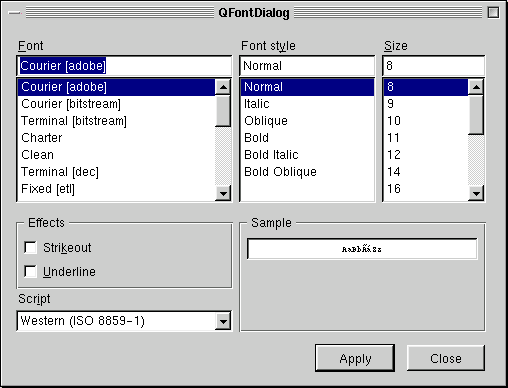 This static function is less flexible than the full QFontDialog object, but is convenient and easy to use. Examples: chart/chartform.cpp, chart/optionsform.cpp, qfd/fontdisplayer.cpp, qwerty/qwerty.cpp, and xform/xform.cpp. The dialog is called name, with parent parent. If the ok parameter is not-null, *ok is set to TRUE if the user clicked OK, and FALSE if the user clicked Cancel. This static function is less functional than the full QFontDialog object, but is convenient and easy to use.